As the largest city ever to seek bankruptcy protection, Detroit may serve as a testament to the strength United States’ economy. No more than a year ago, Detroit represented a beleaguered metropolis in decline for the better part of a half a century. However, having made significant improvements over the course of a year, Detroit is poised to make a remarkable economic resurgence. That is great news for anyone that has already invested in the Detroit housing market, and should encourage others to do the same. 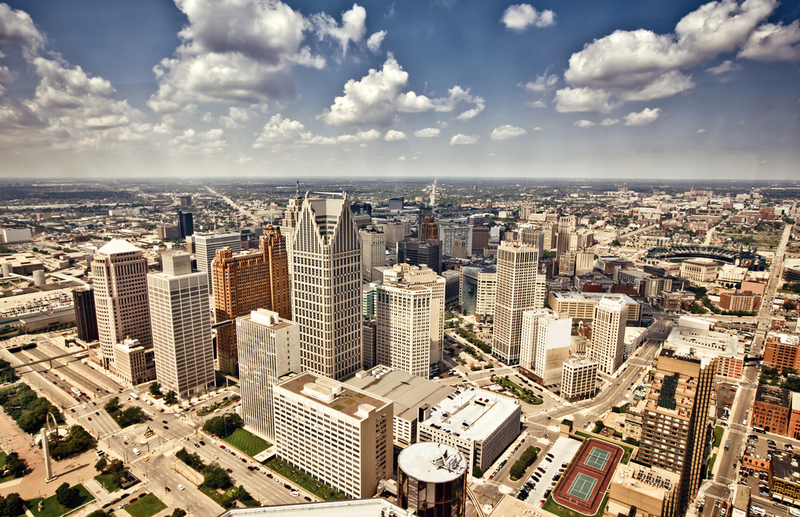 As of July 2013, Detroit held a debt estimated to be between $18-20 billion. The impact was felt in nearly every sector. The housing sector was essentially crippled. The city was left with depressed property values, abandoned neighborhoods, empty buildings and dilapidated schools. Moreover, the average household income dropped to $26,000 – less than encouraging to say the least. However, fast-forward one year later, and Detroit has removed itself from the doldrums of the recession – with gusto nonetheless. Zillow has confirmed optimism by forecasting a 3.4% increase in home prices over the next year. The median sale price within the greater Detroit area was just over $115,000 earlier this year, up from $85,000 the previous year, according to data from the Realcomp multiple-listing service, which doesn’t account for sales of a private nature. Overall, prices early this winter were back to spring 2008 levels and about 25% off their local peak in late 2005 and early 2006, according to the latest Standard & Poor’s/Case-Shiller Home Price Index. Realtors say that the most desirable homes are now receiving multiple offers within hours of hitting the market. “If you’re on the market and you’re actively trying to sell and you’re priced correctly, you’re likely going to sell in less than 90 days and you’re likely going to sell somewhere between 95% and 100% of what you’re asking,” said Lora Kazanjian of Max Broock Realtors in Birmingham. The local market is in favor of sellers at the moment. The growing prevalence of short sales over foreclosures will help drive up the median price in the Detroit metro area up even further. Phoenix experienced a similar situation. Yet in the near term, the region’s housing inventory is expected to stay tight and continue to lift prices up from their post-crash lows. There are fewer borrowers underwater on their home mortgages, but many of them are waiting to see how high prices will rise before they decide to sell — a strategy that keeps home inventories low. The number of homes on the market continued to shrink, to 18,307 in February 2014, down from 20,421 in February 2013. And the length of time it takes to sell a home continued to plunge, by nearly a month — from an average days on market of 84 days in 2013 to just 59 days in 2014. The percent of delinquent mortgages in Detroit is 9.9%, which is higher than the national value. The percent of Detroit homeowners underwater on their mortgage is 41.7%, which is higher than Detroit Metro at 23.2%. For those less acquainted with the idea of an assessment, it refers to what the property can sell for. Accordingly, a higher assessment should suggest that a property can make more money when it is sold, since by law the assessed rate is supposed to be half of the market value. Of course, it is no surprise that assessments are up across the region, as the expansion of the economy has lifted home prices since 2013. As recently as last year, every month saw an increase in home prices. In the period following the recession, circa 2008, approximately 70% of the homes on the market were of the foreclosed nature, or short sales. However, 2014 was quite the contrast, as it was not uncommon for homes to receive multiple bids. Experts expect 2015 to be much the same. Homes for sale in the Detroit housing market should fetch multiple offers. The amount of offers would suggest that inventory is lacking, and it is. The number of homes available is about 18% less than it was at this time last year. On a more pressing note, it is believed that tens of thousands of Detroit homeowners are at risk of foreclosure in the coming year. The reason being: back owed taxes. the county announced it would start cracking down on back taxes, going after some 76,000 properties, about 35,000 of which are occupied. To put things into comparison, a total of 70,500 tax foreclosures filed between 2009 and 2013. That rate was one of the highest in the world – let alone the country. So while the rest of the country speaks of easing foreclosures, do not forget about Detroit. If anything, foreclosures are expected to play a large role in 2015. Investors, in particular, may look to this area for discounted properties. That said, even though things are headed in the right direction, the Detroit housing market is still full of affordable properties.